The shooter was autistic, as was the Sandy Hook shooter. He had regular behavioral problems to the point that his mother would sometimes call the police to come over and talk to him. He was in a degrading mental state. The assault had been planned from the approach to exposing victims, to his escape plan. The mental health issue is both the most complicated, but also the one most likely to tick people off. So, let’s get it out of the way first. When it comes to mass public shootings, mental health may be the common denominator. 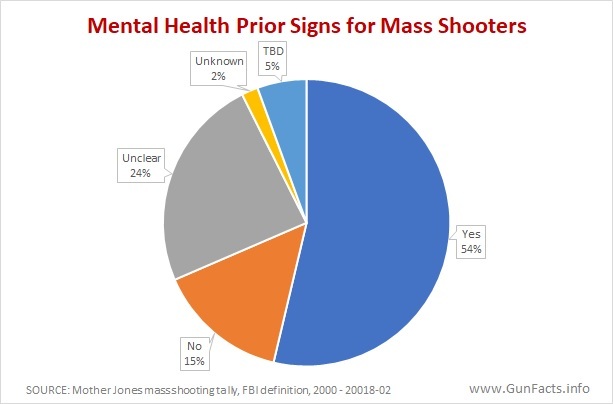 Using one database 1 2 of public shootings, and another one that investigates clues as to the mental condition of the shooters, we see that at a minimum, 54% of mass public shooters had prior signs of mental health issues. The actual (and currently unknowable) ratio is likely much higher. In the Parkland shooting, the mental state of the shooter appears to be deranged. In police confessions he claimed that voices in his head directed his actions. This follows a history of behavior problems seemingly linked to his autism. NOTE: Before anyone bashes me for insensitivity for diving into autism, know I have a nephew with autism and associated behaviors. Some places on the autism spectrum are known for erratic and occasionally violent episodes. This makes certain events unpredictable. Though not universal to mass shooters, we did see autism in America’s two most notorious public school massacres (Parkland and Sandy Hook). Autism does not cover all mental disorders of mass public shooters, but it has recurred often enough to be of interest. Enough so that some mental health researcher are exploring the topic more deeply. There are several complicating factors to devising meaningful policy from the mental health angle (though I do have a proposal to get the ball rolling). There are two general categories for such murderers: sociopaths (who have a lack of empathy for victims) and psychopaths (who have an overt desire to harm others). This factor may help us identify two (or more) policies. The motivations of such persons to kill are, by definition, irrational. Applying a rational policy for a small group of irrational people is difficult. Any policy that controls this tiny subset of the population, yet leaves everyone else alone, is really tricky. My research into this realm indicates that we really don’t know enough about the psychology of mass murderers. This is due in part to medical privacy laws that prevent researchers from aggregating profiles of shooters. State and federal law needs to change to mandate public disclosure of all medical records of these shooters. This is a necessary first step for us to have a real handle on such a killer’s motivations. This would include their pharmacology histories. Family members of the Parkland shooter note that he was under treatment at a mental health facility for his sundry issues. Once relative of the Parkland shooter claims he had been medicated to deal with his eroding emotional state. An open question, then, is what medications he was taking or withdrawing from. Various classes of medications used for mental health patients have well-known, violence-associated side effects. Two of the most frequently used medications for autism – selective serotonin reuptake inhibitors (SSRIs), and antipsychotic medicines such as haloperidol or risperidone – have established withdrawal side effects related to violence. Since the Parkland shooter admitted to hearing voices, the antipsychotic medications become of immediate interest. For haloperidol, some withdrawal symptoms include agitation or aggression, hallucinations and delusions. For risperidone, they include anxiety, confusion, hallucinations, delusions, depersonalization, irritability, mood swings and psychosis. Yet, due to current medical privacy laws, we will likely never know the Parkland shooter’s pharmacology history even after he is executed. Laws are only as good as law enforcement. With Parkland, we see critical failures at both the local and national level. The Parkland shooter was on law enforcement’s radar since 2016. Local police had been called twenty times to tame him. School officials were engaged, and even the FBI had been alerted due to a social media post in which he said he would be a school shooter. Local law enforcement, alerted, did not or could not intervene. Federal agents were alerted, but did not forward notification to the local office. In short, law enforcement failed. It has been confirmed that the Parkland shooter was at least recently under the care of government mental health services. They, more than law enforcement, should have had a handle on any potentially endangering behaviors. Thus far I have found no evidence of these mental health services reporting endangering behaviors to law enforcement. Again, due to medical privacy laws, this may never be disclosed. Now, time for some perspective. First, this classifies as a “mass public shooting” using the established definition honed by the FBI (though social media posts show that people are quite content to make up their own definitions of “mass public shooting” to fit their sundry prejudices). Horrific as it is, we must keep in mind that such events are numerically rare and constitute a small part of firearm homicides. This brings two elements of public policy to the forefront. First, why is that the larger problem – mainly gang-related homicides in poor neighborhoods with victims being people of color – captures little public attention? There have been fits and spurts of spending on gang intervention, but with little effect. Tough solutions should be sought for both kinds of violence; but people tend to focus on the highly publicized mass shootings because those events happen in their more affluent neighborhoods, not the poorer parts of town where they dare not venture. That being said, we see one curious problem vis-à-vis schools. Due to numerous factors (densely packed and confined spaces, high people count, inexperienced victims unable to react well, lack of armed security, and, yes, “gun free zone” policies) the body count for mass public shootings is higher than other venues. NOTE: One grain of salt is required here. Mass public school shootings are statistically rare. That means tallies are statistically fragile. Given that the years 2000–2018 in this analysis include Parkland and Sandy Hook, the fatality rates for school shootings are abnormally skewed. But, this is out of necessity. Since the Mother Jones database is derived from news reports, the year 2000 is the first year in which I am reasonably sure most major news organizations at the metropolitan level had a fully formed online presence. Anything before then begs incomplete reporting. Are school mass shootings a topic that requires special attention because they are inherently different? What would be an effective solution? The answer to the first question is “yes.” When the Columbine Massacre occurred, I said that the fame angle would cause copycat shootings by socially disenfranchised kids. This was the case at Sandy Hook and Parkland as well as some college shootings. Schools are also a special case due to the different physical aspects of the venues – lots of people packed into small rooms, few exit paths (especially in multi-story schools like Columbine and Parkland). Like the recent Las Vegas concert shooting or even the 9/11 World Trade Center attacks, packed places create high body counts. Three of the shooters had prior signs of mental health issues, and for the fourth the case is uncertain. Only one acquired the firearms legally. The Red Lake and Marysville-Pilchuck shootings had ten or fewer fatalities, making the other two – Sandy Hook and Parkland – radical outliers. Handguns and shotguns were the only weapons used in half of the events (handguns and an AR-15 were used in one, and an AR-15 in the other). Given these realities, we see that there is no statistical common denominator on weapon type. We do see a significantly higher student enrolment for Parkland (making it a better killing zone), which is undoubtedly a factor. Due to their young ages, the students at Sandy Hook elementary were ill-equipped for evasion. Perhaps most interesting is the subject of weapons acquisition and mental health (a narrow intersection of topics). We see three quarters of the guns were acquired illegally and three quarters or more of the shooters had prior signs of mental health issues. There may be a legislative fix to deny sales of guns to people suffering mental illness, but it is clear that will not stop the problem. At Sandy Hook, the shooter murdered his mother before stealing her guns. At Red Lake, the killer murdered his grandfather before stealing his police-issued handgun and shotguns. At Marysville, the guns were taken from someone who had acquired them illegally. Given this pairing – mentally unstable people who will steal guns to commit massacres – there appear to be few viable legislative fixes to how guns are acquired. This then devolves the problem to the other side of the coin – mental health intervention. Sadly, some factions have quite adroitly hijacked this tragedy. Two days after the shooting, there was a highly televised rally where students very specifically attacked the NRA and politicians who receive NRA contributions (DISCLOSURE: I am not a member of any group, including the NRA). 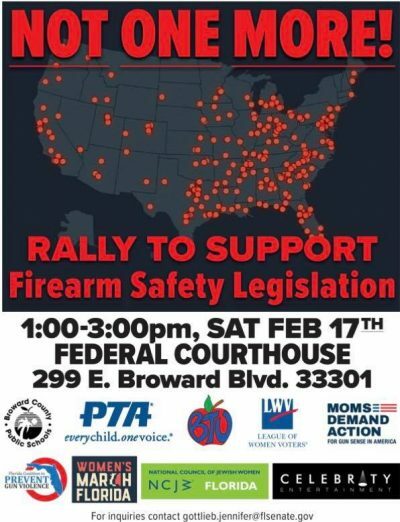 From the flyer for the event, we see it was sponsored/organized at least in part by two gun-control groups. Additionally, browsing the websites of some of the other groups shows histories of advocating for gun control, even outside of school campus issues. I admire the ability of twenty-first-century high school students to self-organize, but this rally was a top-down exploitation of the situation – driven, I would bet, by Michael Bloomberg’s front groups. They likely had sketched out plans for PR well in advance of such events; pre-funded them; and established liaisons with like-minded state and local groups; then created the flyer you see above and rented the sound systems when the opportunity presented itself. Part of this response, too, were the speeches and television interviews given by kids from Parkland. Their very specific and targeted rhetoric is far above the pay grade of a high school student. The constant repetition of anti-NRA memes indicates message coaching. In short, they were likely co-opted by Moms Demand Action (note the similarity in font choices for Moms and the event flyer) then spoon-fed their talking points. Hijacking children for political positioning is now the new normal. The above campaign aside, let discuss legislation, from an efficacy standpoint. ASSAULT WEAPONS BAN: Foremost, most mass public shootings are done with handguns, and a full half of the twenty-first-century mass school shootings were done with handguns and shotguns. 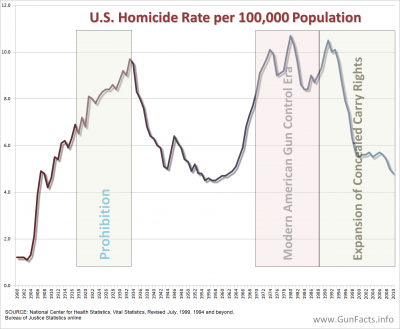 An assault weapons ban, even if it involved mass confiscation, would have no effects since the ease of substitution with handguns would be instant. “HIGH CAPACITY” MAGAZINE BAN: The Columbine killers murdered almost as many high schoolers as did the shooter in Parkland, but did not have anything like an AR-15 (they had a TEC-9, but that is a glorified handgun). Most of the Columbine bloodshed came from two 12-gauge shotguns. Cops keep “riot guns” in their squad cars for a reason – they move a lot of flesh with few shells. Combine all this with the fact that doing rapid magazine changes with a handgun takes very little practice, and that mass murders typically plan their assaults well in advance, and any magazine ban (even with confiscation) is easily mooted by using handguns instead. “UNIVERSAL” BACKGROUND CHECKS: As noted above, three quarters of mass school shootings were done with stolen guns, and half of these instances occurred with guns stolen after the owners were murdered. AGE FOR BUYERS: One of the four twenty-first-century public school mass shooters bought their own guns (the rest stole them). Currently, someone of high school age cannot buy a handgun. We could raise the age to buy a rifle, but at best that solves precisely one quarter of the problem, and given that three quarters of mass school shootings used stolen guns, even this is unlikely to make any progress. Who defines what is mentally ill? It wasn’t so many years ago that the Diagnostic and Statistical Manual of Mental Disorders listed homosexuality as a psychiatric disease. If America were to create an all-encompassing database of the mentally ill, the definition of who is added would be hotly debated. The theft problem. As noted above, crazy people stealing guns is the most common mode for mass school shooters, so the efficacy of the blacklist approach is low. That being said, the authorities being alerted to a crazy person attempting to buy a gun would be a useful notification. Getting off the list. Some people will be misclassified (Senator Ted Kennedy was once on the terrorist watch list, and despite his political power, it took a long time for his name to be removed). Other people may be ill, but eventually get better. Civil libertarians will want the delisting process streamlined from the start. EMERGENCY CONFISCATION: A couple of states have passed laws (poorly written) to allow judges to order the confiscation of guns owned by someone alleged to be a danger to others. Only one of the twenty-first-century mass school shooters bought his gun. It was in a state with no firearm registration (and nearly no states register rifles), so the effectiveness of such laws is restricted to when a person is reported to be of unstable mental health and owns a gun. People may not know the latter even if the former s obvious. PSYCHIATRICS DRUGS AND THEIR CONTROL: Medical privacy laws preclude true understanding of how often psychiatric medications create mass shooters. It is an area of research that needs to begin, and this starts with rewriting medical privacy laws so that the full medical history of mass public shooters is publicly disclosed upon death or conviction. UPDATE 2018-02-25: It appears that there is a significant possibility that autism is one likely factor in events such as Parkland. One tally in an academic paper notes that of 239 killers evaluated, 28% had or likely had autism spectrum disorder (ASD). Autistic people make up about 1% of the population. Statistically, this is of high interest. What are your ideas to create safer school buildings and grounds to keep the murderers away from our children? ie: armed guards, armed faculty, locked, metal entry doors and gates to the outside, etc. At this time, I have no specific proposals. I would have to research to identify what has efficacy. 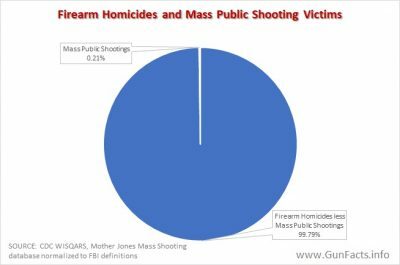 That being said, FBI research has noted that nearly all mass public shooting events end when the attacker is killed or cornered. Armed security stands a better chance of ending a shooting. We also know from research that garden variety criminals avoid armed victims. I’m unsure if mass shooters with mental disorders would be similarly dissuaded, but suspect they would (they may be crazy, but they do think and plan their assaults, and they want results … anything that keeps them from achieving a high body count make the event less appealing). One aspect is proactive lockdowns. In Sandy Hook and Parkland, the shooters entered after classes had started. If you had to pass security after classes started, it might eliminate a common form of entry. Most important though is unraveling why these people want to kill and defusing them before they go critical. It is clear from the facts in this case that the young man was clearly mentally disturbed. We already have a process in place for handling that sort mental illness. The mother clearly knew has she had called for police intervention. The police knew, as they had responded to those calls. The school knew as they had expelled him for communicating a threat. Any of these three parties could, and should have filed a competency petition on this young man. WHY wasn’t this done. Before we go looking for other remedies to the problem of violently mentally ill which may unnecessarily limit the rights of those who are not and never will be a threat, we FIRST need to find out why the system we have DOES NOT WORK. And at Parkland, this legislative fix was IN PLACE, but never exercised by any of the scores of government officials or healthcare providers who were aware of this violent and troubled youngster. After the immediately previous mass shooting, we discovered that over 4,000 military dischargees who should have been reported under similar legislation were never reported. When the government will not put in the effort to implement its own existing gun control restrictions, it seems clear that we have passed the edge of efficacy of legislation. An excellent article. Thank you for your observations and analysis. I am forwarding it, with attribution and linkage of course, to my entire list. Thanks again. Jim from Arizona speaks for me as to door locks. What’s known as a storage room lock such as the Schlage L9080 would be the lock to use. Automatically locks when the door is closed such that ingress requires a key and egress requires pushing the handle down. As to mental health, to make a wild guess, just for males under the age of, say, 24, there might be tens of thousands who have been, or are under professional medical care for depression, autism, schizophrenia, antisocial behavior and the like. Involuntary medical incarceration likely would be limited to 72 hours, as it was some 40 years ago. Longer holds likely would require a court order. For all practical purposes, would not a public outcry and ensuing litigation against a government data base of any such medical care and medical incarceration for children, if for no one else, prevent any such intervention? Notwithstanding the large scale of effort and the seemingly high probability of a future incident in which the perpetrator previously had been treated, medically incarcerated, and even adjudicated as mentally ill, the effort while not futile, would seem exceedingly ineffective. It has seemed to me ever since reading about the teacher at Columbine (math?) who was murdered when, unarmed, he engaged one of the murders, that the last resort, and by far the most potentially effective response, is for a number motivated staff at any given school to be trained, certified and armed by local law enforcement for responding to an active shooter. My own experience as armed posse on the school patrol detail with the Maricopa County Sheriff’s office (Phoenix, Arizona) is that we routinely inspired teachers and some parents to greet us with their middle finger. A typographical question. Tbe article mentions “VT” without defining it. Ordinarily, VT = Vermont, but this article doesn’t mention anything related to Vermont. What gives? My bad. It stands for Virginia Tech. Will edit. After we arm the teachers, we can start to eliminate PCBS. Scarlett Lewis’ 6-year-old son Jesse was killed in the Sandy Hook Elementary School shooting. The problem with emergency confiscation in practice is the person who has their firearms confiscated has to have deep pockets to afford the attorney’s fees and suffer wo/their property for months or years to recover the firearms. Sheriffs & police dept’s are notorious for dragging out the process of returning seized property. None of the state laws have any penalties for failing to return property. I would only support these laws if it included financial penalties for agencies that don’t return the firearms within 30 days after the confiscation order expires and plaintiff’s attorney’s fees were automatically paid by the defense. I’ve found evidence that several of the recent mass shootings involved multiple shooters (you won’t find this on the major networks). So if that is the case, how do you prevent these types of shootings? I would need solid evidence of two or more such circumstances. By “solid” it would include things like mismatched expended cases, video evidence, bullet fragments from different guns extracted from the scene. How would one go about getting access to this type of evidence? Which kind of evidence are you referring to? How would the average American gain access to evidence, like mismatched expended cases, video evidence, bullet fragments proving or denying different guns found at the scene, etc.? Is this possible? Is this released to the public in any shape or form? I don’t typically follow conspiracy theories and the like, but if I wanted to confirm what I am given in the news, it seems all I can do is trust what they say is truthful. If I see conflicting information, how do you confirm the validity of it? Putting your hands on the actual evidence is unlikely. Though most police departments issue detailed reports of events like a mass shooting, evidence is tightly controlled to prevent tampering, loss, damage, etc. Outside of being in law enforcement and having a need to review evidence, odds are you could never get close to the stuff. The only real alternative is to obtain the formal reports and trust the cops who published them.